Dentist Dr Sunny Sihra from London, UK, is bringing technical and design innovation to the $37billion global oral care market* with Dentii (http://www.dentii.co.uk/ ). Dentii is a new integrated dental healthcare range comprising immaculately designed, sleek electronic toothbrushes, with single use, interchangeable brush heads which has just launched on Kickstarter http://kck.st/2sIiLQ2. At the core of the Dentii range is a smartphone app which connects to the electric toothbrush and maps the geometry of a patient's mouth, noting the brushing paths and pressure. Via the app, the data is sent to the user's dental professional for analysis and then if necessary, they will inform the patient on how to improve their dental routine. What's more, Dentii is being developed as the world's first toothbrush that can prompt an individual to go to the dentist at early signs of problems. With patented technology, Dr Sihra is also keen to develop this into the world's first oral cancer screening tool. The electric toothbrushes are manufactured in Anodised Aluminium, plus Silver, Gold or Rose Gold versions for maximum sophistication. The bases are designed with a bespoke range of wood finishes, making the brush stand out and look elegant. As back-up for those who travel a great deal, manual toothbrushes and travel cases are available in a range of wood finishes. According to the University of Manchester, UK, the average toothbrush can contain 10million bacteria or more, including E.coli and Staphylococcus aureus**. As an answer to this, Dentii is introducing the single use, disposable brush head that is fully biodegradable and can be disposed of alongside discarded food or composted. The brush head represents a revolutionary approach to the hygiene issues found in multiple use brush heads, namely the daily increased contamination by bacteria, fungus and chemicals typically found in bathrooms. The whole system is subscription-based so that people never run out of a fresh supply of brush heads, toothpaste and mouthwash. Dr Sihra explains, "As a dentist, it concerns me that while the rest of the world has moved on with technology, transforming almost every area of health and fitness, the oral healthcare market has hardly changed. Even my own patients are using products designed decades ago. This is why I teamed up with designer David Fowler from city of London-based INDEV (http://www.innovationdevelopments.com/) to create Dentii. "By bringing together innovative technology, revolutionary design, fine materials and functionality, we're providing patients with a truly innovative, unique and exclusive cleaning experience. It's not just aesthetically pleasing but represents a world first in this business sector. "This innovation represents a new era of oral care products that will make a significant contribution to the global oral care market that is set to grow 16 per cent to $43billion in the next five years." Dentii has just launched on Kickstarter (http://kck.st/2sIiLQ2), with nine reward packages available. The pledge options range from £59 to £299 and rewards depend on the pledge taken. For a pledge of £59 the funder will receive a silver electric toothbrush, complete with the Dentii app, charging base and charging lead and a three-month subscription of single use brush heads. A pledge of £119 adds a stylish travel case, mouthwash, interdental brushes and toothpaste. 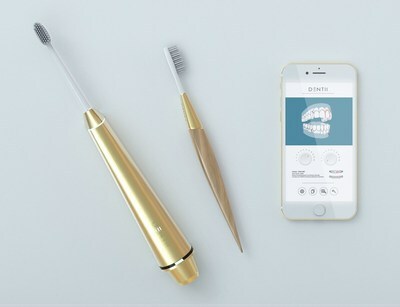 For those looking for a more luxurious cleaning experience, a pledge of £199 will afford a sophisticated gold-plated toothbrush complete with the Dentii app, charging base and charging lead, single use brush heads, travel case, mouthwash, interdental brushes and toothpaste, each with a six- month subscription. For added luxury, a pledge of £299 will include all of the above but with an exclusive, premium Rose Gold plated electric toothbrush and a 12-month subscription.